GDSInc. 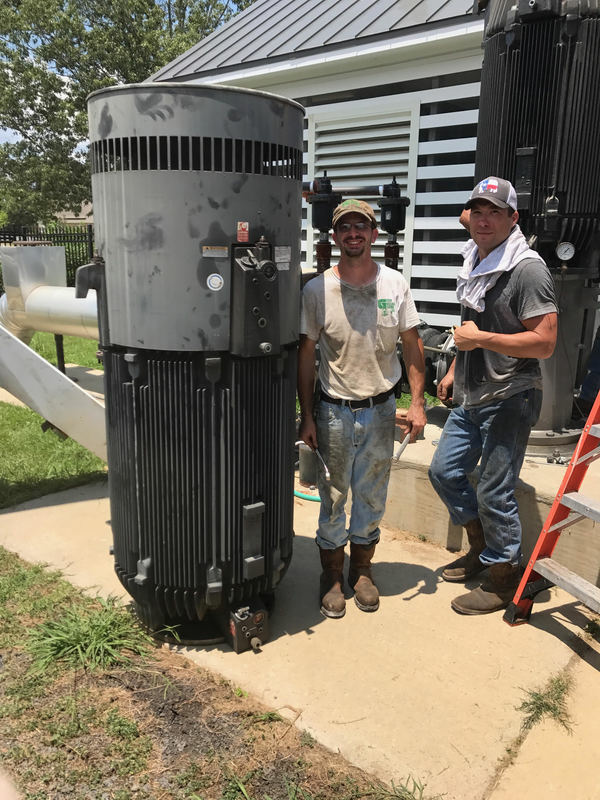 - Well Service and Repair - Griner Drilling Service, Inc.
Richland, MS employees, Larry Palmer and Doyle Smith perform maintenance on a 400 HP Well Motor for a customer in the Jackson, MS area. The motor is specifically designed to create less sound as to not disturb the horses which are stabled adjacent to the well site. Griner Drilling Service, Inc. continues to be a leader in the industry with more than 50 years of experience in well service and repair. Our service department is comprised of highly trained personnel supported by a fleet of service rigs and over 100 support vehicles and equipment available to accommodate all your well, pump, and control system repair and maintenance needs. We are committed to providing first class service to our customers 24 hours a day. We also offer complete machine and pump repair facilities. Our pump specialists offer expertise in pump machining, assembly, and repair to ensure the timely repair of any pump problems you may encounter.